With this package, enjoy the activity of your choice and a plate of our specialty foods (one per visitor) that you can enjoy on one of our patios, 25$ per visitor. Remember to set aside at least two hours for this option. Join one of our regularly scheduled tours or make a group reservation. Introductory Guided Tour – led by an experienced guide. Covers the history of L’Orpailleur vineyard and grape growing in Quebec. A full day dedicated to wine tasting including tours and exclusive tasting workshops to discover local wines, in the company of a friendly guide. This all-inclusive excursion includes an outdoor lunch and visits to inspired winegrowers. You’ll tour the Brome-Missisquoi wine growing region, where three vineyards await! 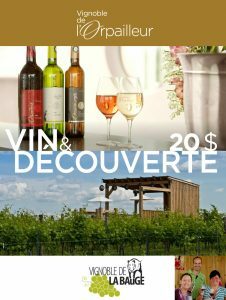 If you book your accommodations with one of our partners, you’ll receive a discount to visit La Bauge!